Were you shocked when you were called up to the Springbok squad? Shocked is an understatement. I was at home when Rassie Erasmus called and asked how I was and what shape I’m in. I had a suspicion I was being pranked by my teammates, so I had to check if it was really his number. It was and I was never more chuffed than at that moment. I hope to repay his faith in me by adding value to the team in whichever way I can to build the Springbok brand and make the team better. How does it feel to be back in the Springbok fold? To be quite honest, it hasn’t sunk in yet. Before, whenever I was asked about the best moment of my career, I’d say it was the first time I was selected for the Boks. But this call-up has surpassed that moment. For me, this is probably the pinnacle of my career. To be considered good enough to play at this level again has injected new energy into me – not that the drive wasn’t there before. I’m still pinching myself and thinking, can this be real? I’m honoured to be here and can’t describe the feeling. I was nervous of coming into this environment, but it’s a great atmosphere, probably the best I’ve experienced in a Bok set-up. There are no egos in the camp because no one feels and acts as if the Springboks belong to them exclusively. Everybody welcomed me back with open arms when I arrived and that made it a lot easier than I thought it would be. After the first meeting I attended, I felt comfortable and at ease with my teammates; not because I’ve been here before, but because the environment is so good that everyone can flourish. Everyone is working hard to make the Boks better, whether it’s the players or the coaches. We have a common goal and that is to be the best team in the world. At 36, did you ever expect to be called back into the squad? They say age is just a number [laughs]. Eighteen months ago I wasn’t even thinking about the Springboks; I thought that ship had sailed a long time ago. But, to be honest, recently I had hoped I might get in through the back door. We’re a year out from the World Cup and I’m on the end-of-year tour. I want to grab this opportunity; whether it is to play or help the younger guys in the squad, I want to contribute. Whether it is to push the younger guys forward, share some knowledge, or just carry water, I want to make a positive contribution in whatever way I can. Some of the young guys are in their first season of Test rugby and I want to feed off their energy and learn some new methods and positive habits from them, just to get that fire in the belly again. I’m here to add value, but I also want to learn. Initially, I signed a four-year contract extension at Grenoble, thinking I’d probably finish my career there. I loved my time there; it’s a great city with wonderful people. And although my first six months were difficult because of things like the language barrier and driving on the right-hand side of the road, I rediscovered the freedom and enjoyment of playing the game. Financially, it would’ve been better to stay at Grenoble, but once I signed that extension, it felt like the fight in me just wasn’t there any more. I had achieved what I wanted at that stage and I felt like a bit of complacency had crept into my game. I needed a different challenge and when the opportunity arose to play under [Toyota Verblitz coach] Jake White, I couldn’t turn the offer down. I didn’t leave Grenoble because I was unhappy there; I just needed something new. In Japan I found that hunger to have that last dance and challenge for a trophy. Last season we fell short in the semi-finals; hopefully this season we can go one step further. Going to Japan was a good step for my career; we’re building a nice environment. We want to go on and win the league. What’s it like working with White? The Springboks won the 2007 World Cup because he is such a fantastic coach. He took Verblitz from constantly finishing mid-table to the semi-finals, where we lost to an unbeaten team. System-wise he is exceptional, he has implemented a good programme. He isn’t just there to fill up the post as head coach, he is there with the purpose of making Verblitz better and, as players, we feed off that. When I started at Western Province, I worked under Rassie, who is a tactical genius, and later it was Allister Coetzee and Robbie Fleck. At Grenoble, it was Bernard Jackman. But Jake is a serial winner and to be coached by him was one of the reasons I went to Japan. I wanted to see how he operated and I’ve already learned so much from him over the past 18 months. You’re one of seven South Africans in the Verblitz squad. How have you enjoyed your time with them, as opposed to Grenoble, where you were the only South African? I matured a lot in France. When I was in Cape Town, I got used to a certain lifestyle. In Grenoble I matured in terms of being on my own without assistance from family and teammates [away from the game]. So when we moved to Japan – this is something my wife and I speak about – we were used to being seen as just random foreigners. To us, having South Africans in and around us in Japan became a bit of a luxury. Yes, we go out to lunch and dinner at each other’s houses and it’s nice, but because I was chucked into the deep end at Grenoble, I now consider having familiar faces and recognisable accents around as a luxury. How does the level of competition in Super Rugby and the French Top 14 compare with the Japanese Top League? It’s difficult to compare leagues. Like Super Rugby, the Top 14 and Top League have their strengths and challenges. When we watched Super Rugby matches over in France, some of the Irish guys in our team would say it looked like they were playing touch rugby. Super Rugby is explosive, fast and intense because the teams are so potent in attack and making a mistake is always punished. It’s basically a semi-international competition, a curtain-raiser for Test rugby. Then you go to France where, in my opinion, the guys aren’t as fit as they should be because they only get seven weeks off at the end of a campaign before the next season starts again. In that short time, you have to work in pre-season training too. You tire physically and mentally because you play through all four seasons in one campaign. The French league is forward-based. They work their backsides off when the backs will often just kick it around and score. The Japanese league is not as physical, but it is really fast and there are quite a lot of handling errors. You’re only allowed to have three foreigners on the field at one time and have to rely on the Japanese boys to pull through. Sometimes that is a problem because the three of us on the field come from a rugby background, but most of them only started playing as adults. They’ve got the work ethic, but their mindset in certain match situations isn’t what it should be. They are willing to learn, though, and the league is getting better every year. 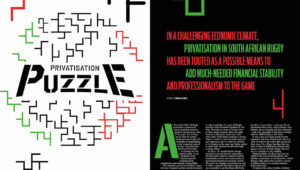 It’s just that the intense physicality and accurate decision-making are not there yet. What have you learned as a player abroad and how has your game developed since you left South Africa? In South Africa, I was lucky to start under Rassie, so I got a good base to understand and analyse the game better. When he came to Cape Town, he shook my world with the way he thinks about and analyses everything. Also, in South Africa, you always wanted to play well because you wanted to play for the Boks and because of that you were afraid to make mistakes. Overseas, the first year was tough, but in the second year I took more chances because I learned that a mistake there isn’t as crucial as it would be in Super Rugby. The crowd is a bit different. In France the fans always look at the positive things you do on the field rather than the errors you make. I learned to express myself more, rather than going into my shell. 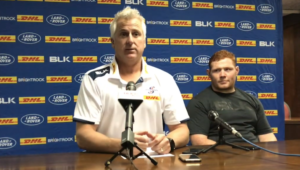 In Super Rugby, you have to keep a decent reputation because you have to keep in mind the national selectors are watching. My shackles came off in France. In Japan it’s different; I try to play with flair but also with more responsibility because the Japanese players look up to us. We need to spark the team and set a good example, while keeping a high standard. 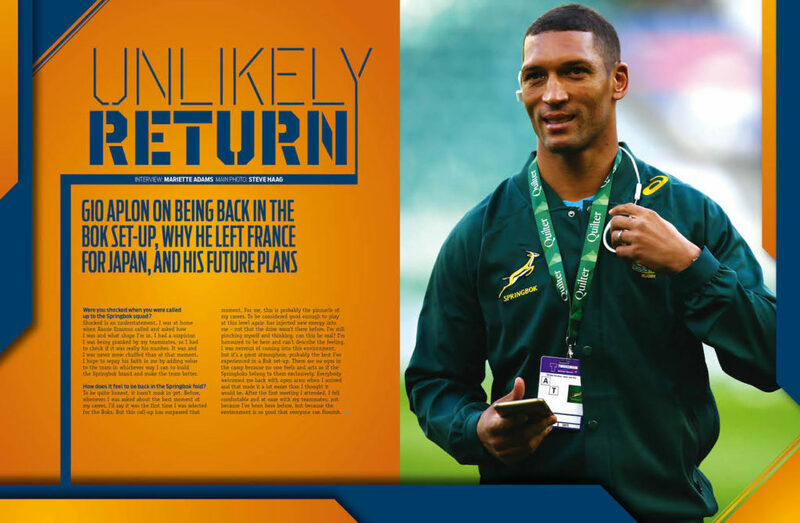 Erasmus called up Toulouse wing Cheslin Kolbe during the Rugby Championship. You are similar in terms of size and style of play. Does his selection give you hope that you can play a significant role for the Boks? Yes, I look at the progress and the impact he has made for the Boks and I believe I can do the same. He is a way better player than me; I’m probably the iPhone 5 and he is the iPhone 6, and that is some upgrade! 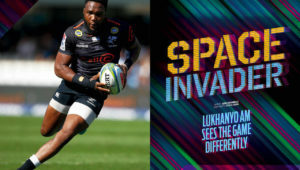 At 23, he has played for the Stormers, moved out of his comfort zone to play overseas and is now a capped Springbok. Every time I see him in action I’m happy and now I’m happier because the world can see him play Test rugby. So yes, I see him flourishing in the Bok jersey and I want to do the same. He and Damian McKenzie are proof enough that there is a place for small guys in Test rugby. I’m older now and a lot of people say I’m over the hill, but if I play for the Boks again, I want to strengthen the theory that small players can shine at international level. Before this tour, the last of your 17 Test matches came six years ago, in 2012. 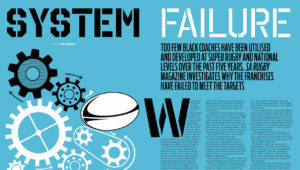 Do you believe you are still up for the rigours of international rugby? I do believe I am up for the job and can make a positive contribution on the field. My body is holding up well, but I can only tell after playing a Test whether I was right or wrong. The plan is to play until I’m 40. No, I’m joking! I’m completing my Bcom accounting degree, which I started way back. I’m caught in two minds: I could get an office job and do the whole nine-to-five thing and spend the evenings with my family and Saturdays next to a sports field watching my kids compete. I’m also considering taking up coaching. Rugby is a puzzle to me and I’m trying to figure it out. But it is also taxing on the family life and if I go into coaching, it will be selfish. My wife and kids are always adapting and changing to cater to my needs and I need to give back to them. I really want to coach, but at the same time my head tells me to invest more in my family. It’s going to be a tough call, but I will make it when I get there in a year or two.